The first University of Waterloo President’s Lecture of 2019 happened on Wednesday, Jan. 30. 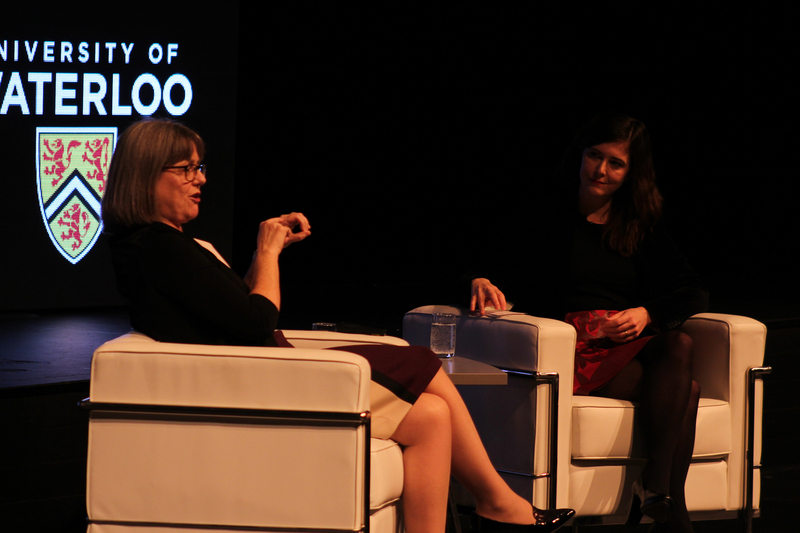 The speaker was Waterloo’s own Nobel Laureate, Professor Donna Strickland. The topic of the lecture was, on the very subject which led to her being the third woman in history to hold this distinction. Chirped Pulse Amplification (CPA) as a means of creating high intensity lasers has become an important part of modern society. However, lasers themselves were only invented in the 1960s, and this method of amplification was not discovered until the 1980s. This was, when Professor Strickland dedicated her Ph.D. thesis to experimenting on the subject. Professor Strickland mentioned how CPA was originally only one part of her idea for a Ph.D. thesis. The other part involved trying to find a way to twice ionize nickel (something which has since been deemed impossible). However, doing so would involve the use of a powerful laser which could emit short pulses of light, something which could not yet be done. To help iterate why, Professor Strickland explained how light comes in pulses, with laser light being no exception. The energy from a one-second pulse of laser light is contained in a beam that stretches a very long distance due to the high speed of light. By shortening the pulse of light, the same amount of energy creates a much denser and more powerful pulse. However, with a standard laser design, the density of energy ends up drilling holes in the material used to amplify the laser. For this reason, lasers of the time only created long pulses. The solution, as Professor Strickland put it, was “so simple, you’ll wonder why I got a Nobel Prize for it.” Her method involved using optical fibre to cause the light to “stretch” into many different colours. Light comes in a range of colours between red and violet, with red light traveling faster in optical fibre than violet. This would mean, that after passing through the optical fibre, each colour can pass through the laser amplifier at a different time, causing it to act like a longer pulse of light. Once through the amplifier, the light is passed through another device, only this time violet light travels through fastest and red travels slowest. The result allows the different colours to be put back together into one powerful short pulse of light. Traditionally, lasers are thought of as something that burns material, but the result of CPA has turned out to be quite contrary to this. Because the light is still low in energy but high in intensity, it generates a lot of force without producing a lot of heat. During the lecture, Professor Strickland referred to it as her “laser hammer.” This simple fact led to the possibility of CPA lasers being used for applications not heard of before, the most distinctive being laser eye surgery. These practical applications of her research are what led to her being awarded the Nobel Prize in Physics. The lecture concluded with a description of the Nobel Prize ceremony, and the moment where Professor Strickland went from, as she said, “[a physicist] just trying to do a great Ph.D., and somehow, [landing] in the middle of a fairy tale.” The ceremony saw her meet with the King of Sweden as well as the rest of the Royal Family. Nobel’s will specified that physics be awarded first, and so Strickland did not receive any lack of attention while in Stockholm, nor has she received any lack of attention since. In a fireside chat after the lecture, she mentioned some of the advantages of having won the Nobel Prize, including using the moment to state how important it is to encourage people to do what they love. She mentioned her belief that a big reason why the percentage of women in physics has not risen, as much as in other fields, is because of how people are encouraged to go into specified fields, of which unfortunately does not include physics. This can lead to discrimination in certain fields lasting longer than others. She put a final emphasis on how encouraging people to do what interests them, not just what would make a lot of money, would make the world a better place for everyone.